draw a sample of gas from the catalyst regenerator. A portion of this gas passes over the zirconia sensor. Because the aspirator gas contains no oxygen, the sample can simply be returned to the process. 2000 Series Microprocessor Control provides 4 line local display, analog outputs, alarms, expanded system diagnostics, auto calibration option and RS485 communication. Principle of Operation (O2) Close-coupled nitrogen-aspirated oxygen analyzer using zirconium oxide for net oxygen measurement. Diagnostics Watchdog timer and service alarms. Twenty-entry event log. Calibration Calibrate or verify calibration. Stored calibration and verification data. 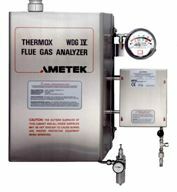 Selectable calibration gas run time and process recovery time. Timed automatic calibration with optional Remote Calibration Unit. Enclosure Weatherproof, purged, stainless steel - wall or panel mount NEMA 4X. Bolted explosion-proof optional. Power Requirements 115 VAC, ±10%, 47-63 Hz, 740 VA max. ; 230 VAC, ±10%, 47-63 Hz, 740 VA max. UL Listed for NEC Class I, Division 2 with the Division 2 option.